Through the years, Boilerplate, the robot, has enjoyed many fascinating adventures: Fighting side by side with Teddy Roosevelt in the Spanish American War. Blocking bullets intended for Pancho Villa. Pulling sleds to the South Pole. But perhaps none has been as strange as the robot's recent foray into the publishing world, which has propelled Boilerplate and his creator -- Portland graphic artist, illustrator and history buff Paul Guinan -- onto the pages of The New York Times. It's a strange tale, one that touches on issues of truth, reality, accidental chicanery and willful suspension of disbelief, even among the most rational of minds. But first, some background: Guinan, 40, originally created Boilerplate the robot as a protagonist for a graphic novel. He had given a great deal of thought to the character, he said in a recent interview at the downtown offices of Mercury Studio, one of the largest comic book studios in the nation. Guinan is a member. Long fascinated both by science fiction and by the faith in technology that America and Europe clung to before the disillusionment and horror of World War I, Guinan decided to create a robot soldier, invented in the 1880s to "resolve the conflicts of nations without the deaths of men." "I wanted to create a protagonist I could send on historical adventures and hopefully turn people onto history in an educational way," said Guinan, a self-described "military history buff." The financing for the graphic novel fell through, though, and Guinan began to put all his Boilerplate material on a Web site, www.bigredhair.com/boilerplate. He also began to play with Photoshop software, placing the robot in historical photographs and writing elaborate fictional accounts of the robot's exploits, using details from actual events. "The site was never meant to deceive anyone," Guinan said. "It was just me having fun with Photoshop." But soon, he began receiving e-mails from people who clearly weren't quite getting it. "The black-and-white photos of boilerplate dont look real to me," one person wrote. "I cant figure out if . . . in fact the photos are real. Its hard to imagine the technology back in that time was advanced enough to not only make a working robot, but a fighting one at that. Please shed some light on the matter." Guinan even heard from "people with credentials," as he puts it -- "scientists, robotocists," asking detailed questions about Boilerplate's origins. "That," Guinan said, "was when the whole thing began to snowball." Guinan dropped clues into the site to help people understand that Boilerplate was a work of fiction. He sprinkled copyright and trademark notices throughout. He even included a link to an article in U.S. News & World Report that referenced the site as a hoax that can "happen by accident." Still, people kept falling for Boilerplate, wanting to believe in him. 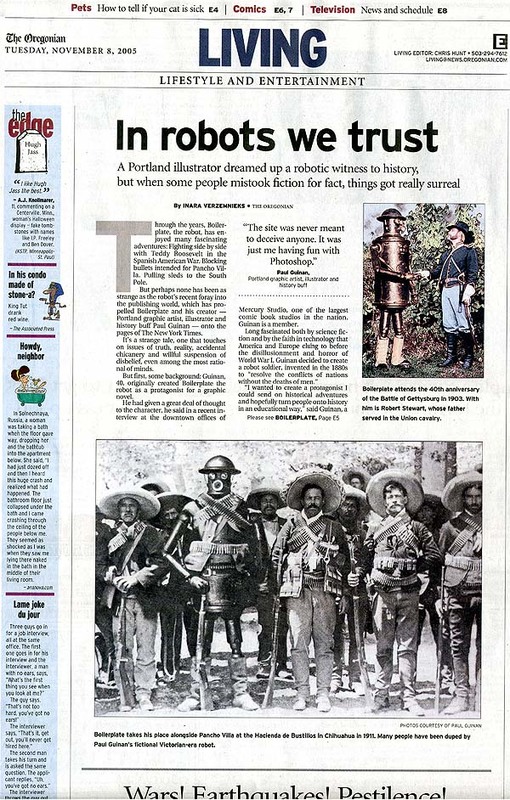 Never mind that the technology to create a "mechanical man" like Boilerplate didn't exist in the 19th century: There's a photo of a robot standing next to Pancho Villa. So, a lot of people had fallen for Boilerplate through the years. But none in such a spectacularly public way as actor and comedian Chris Elliott, best known for his turns in "There's Something About Mary" who wound up including Boilerplate as a historical figure in his debut comic novel, "The Shroud of Thwacker." Guinan learned of Boilerplate's inclusion in the novel, a parody of period mysteries like the ones by Caleb Carr, only after his wife spotted a piece in Willamette Week about a reading Elliott was holding in Portland. The piece mentioned that Elliott's novel, which chronicles the hunt for a serial killer named Jack the Jolly Thwacker, included a strange round-up of real characters, including Yoko Ono, Teddy Roosevelt, Marilyn Monroe "and, mysteriously, Boilerplate -- local comic artist Paul Guinan's famous (and famously fake) character of a Victorian-era robot soldier." "My initial thought was it was just a cameo," Guinan said. But after he bought the book, he realized Boilerplate, as well as Archibald Champion, the robot's fictional creator, were more than just passing characters. "You can't make up something like Boilerplate -- well you can, but it's a lot easier when your brother just shows you a picture of it," Elliott wrote in the book's acknowledgements. Guinan, who had recently created the graphic novel "Heartbreakers Meet Boilerplate" with his wife, Anina Bennett, was unsure what to do next. He decided to go to Elliott's reading but didn't say anything to him at the time. Someone else in the audience, though, brought up the question of Boilerplate, and the next day, out of the blue, Guinan said, he got an "apologetic and sincere" call from Elliott. "He took the initiative for us to work this out ourselves, artist to artist. In the end, according to Guinan, they crafted a deal: Elliott would pay Guinan a percentage of the earnings of the novel and would also make sure Guinan was credited for Boilerplate in future editions of the book. The strangeness of a comedian writing a spoof who gets taken in by a spoof eventually attracted the attention of The New York Times. "It was an innocent mistake, and I feel like such an idiot, " Elliott told the Times. "It made me feel like less an idiot that the background information he gives on his Web site is fairly convincing." Guinan, for his part, said he has absolutely no hard feelings toward Elliott and in fact appreciates how Elliott handled the whole affair. "I give him huge points for standing up and taking personal responsibility," he said. "Especially in this day and age when taking personal responsibility is such an antiquated notion." As he read Elliott's book, Guinan said he found himself laughing at the jokes that Elliott had written for his creation. "If I was in a position to pre-approve, I would have," said Guinan, who last week was still trying to process all the attention that Boilerplate's latest adventure had generated. ("Der Spiegel carried the story today," one of Guinan's studio members, Steve Lieber, called out at one point. "No way!" Guinan said. "Where do I get a copy of Der Spiegel? Wow!)" "Boilerplate nodded to me and let out a loud steam whistle, as if to say goodbye," wrote Elliott, in the last few pages of his book. "Call me a sentimentalist, but I think the big lug had grown quite fond of me in our time together."